“Above all, there was a belief in the revolution and the future, a feeling of having suddenly emerged into an era of equality and freedom. Human beings were trying to behave as human beings and not as cogs in the capitalist machine. 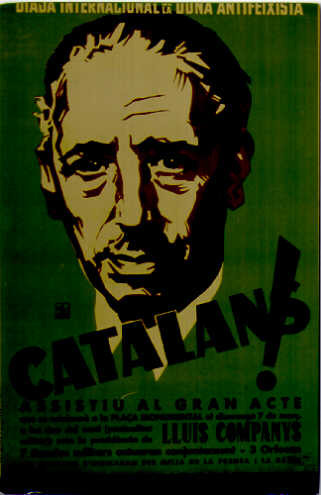 On this date in 1940, Catalan president Lluis Companys was shot by the Spanish fascists. Companys had held that notional office for mere hours six years before — but he’s still the last to hold it in any form at all. Political exile was no unfamiliar terrain for Companys. As a young lawyer, his activism in the first two decades of the century had seen him incarcerated over a dozen times; in fact, his path to political respectability had entailed getting out of a Menorca prison in 1920 courtesy of the parliamentary immunity conferred by winning an election. And he’d drawn a long sentence for an attempted 1934 rising against a center-right government — the occasion when he had become the President of the Catalan Republic on October 6, and been dispossessed of both office and state by the very next day. That prison sentence’s reversal by the new republican government in 1936 was a bit of Pyrrhic victory for Companys’s left-wing politics — inasmuch as said republicans’ ascent was also the trigger for the nationalist revolt that resulted in the Spanish Civil War and a military dictatorship lasting until the 1970s. As the virtual personification of Catalan national aspirations, Companys remained head of the Generalitat de Catalunya from 1933 until his death — in prison, in exile, wherever Companys went he bore along the Catalan cause. As such, he was in the thick of the civil war’s scrap for control of Barcelona: not only against the fascists but among the left parties whose fractious alliance tore apart in 1937.
Who knows but that even these evil days were not still the best that could be made of a bad circumstance: whatever they were, they were not enough for republican Spain or for Catalonia. When those dreams fell under the fascist advance little more than a year later, Companys couldn’t flee Franco far enough for safety. Soon after his 1939 escape to France, that country was overrun by militaristic rightists from the other direction — and the German occupiers happily handed Companys back to Spain as soon as they got their hands on him. Spain, where questions of Catalan sovereignty and the Franco years are both sensitive subjects, has never reversed the judgment (Spanish link) against Companys. However, a Barcelona promenade is named in Companys’s honor, as is a major stadium — actually the arena where the anti-fascist 1936 People’s Olympiad in opposition to the notorious master race spectacle of Berlin was to have taken place, before that whole Civil War unpleasantness. excusez mon pauvre français – je suis allemand et je n’ai pas parlé français il y a 50 ans. Je m’intéresse en le monument pour Lluis Companys sur le Col de Manrella, particulièrement son inscription, et plus particulièrement en la question que veut dire le “OTB” vers le fin de cette inscription. Je ne parle rien de Catalan, comment je pourrai en savoir!? Pouvez-vous me dire, s.v.p.? excuse me: I don’t speak Catalan, I’m German. I am interested to learn what the “OTB” means at the end of the inscription on the monument for Lluis Companys on the Col de Manrella in the Eastern Pyrenees. I’ve been searching and i didn’t found nothing explaining it, but it says “OTB 1981” i’ve found that 1981 was the year of inauguration and i suppose “OTB” means “OcToBer” (it’s also the month of the execution, but that abbreviation isn’t common). Then i think the inscription is the month of the innauguration of that monument.